“Georgia’s baseball culture has led it to become one of the most productive states in the nation. The state pumps out first round picks every year, with the Atlanta area usually home to several. This year, most of the prep talent in Georgia is far from Atlanta, with top prospects coming from the southern and eastern parts of the state . 18. Devonte Brown, SS/RHP, East Coweta, Sharpsburg, Ga.
23. Jason Rooks, OF, Walton HS, Marietta, Ga.
40. Michael Guldberg, OF, Walton HS, Marietta, Ga.
46. Colin Hall, OF, Wesleyan School, Peachtree Corners, Ga.
Oscar Serratos SS/RHP Grayson HS, Loganville, Ga.
Serratos has a projectable 6-foot-1 frame and a solid all-around collection of tools. He shows smooth footwork and actions in the infield to go along with above-average to plus arm strength. Serratos flashes quick hands in the batter’s box and can show natural timing in batting practice with the ability to spray line drives to all fields. Scouts aren’t sold that his line-drive ability can play against elite pitching; he showed some swing-and-miss on the showcase circuit and this spring. Serratos is an average runner and not a lock to stay at shortstop. He’s an exciting prospect on the mound, where he has less experience. Serratos can reach the low 90s with his fastball and has shown promise with a changeup. He is young for the class and won’t turn 18 until September. Serratos is committed to Georgia Tech. Trammell made a name for himself on the showcase circuit with his blazing speed. He is a plus-plus runner in game action, with the ability to reach first base in less than 4.1 seconds after the ball comes off his bat. Trammell also shows upside with the bat; he has above-average bat speed and a sound understanding of the strike zone. Trammell made steady progress throughout the summer and fall, and has shown intriguing power this spring, with some rating it as an average tool. One of the biggest weaknesses in his game was his arm strength, and he worked hard in the offseason to improve it. What was once graded as a well below-average tool now earns 45 grades from some scouts, giving him enough arm strength for center field. Trammell is an exceptional athlete and the needle is pointing up on him. He is committed to Georgia Tech, but his strong spring performance could make him a day one pick. Known more for his smooth actions at shortstop, Justus produced excellent offensive results for Georgia Tech this season. His swing starts with a high hand set, then he drops his hands down and back to load up. He shows the ability to pull the inside pitch over the fence, or stay back and hammer the outside pitch to the gap in right-center field. Justus has shown more selectivity at the plate this season, and as a result he’s accumulated more walks than strikeouts. His carrying tool will be his defense at shortstop, where he shows above-average body control and the ability to range to either his left or his right. He has an average arm. Johnson has long been known among the amateur scouting community for his right-handed power bat, but there were major concerns on his bat coming out of high school. He struggled on the showcase circuit and played meager competition in the spring, playing in a league for home school students. Johnson was the No. 268 prospect in the 2014 BA 500, and now he’s back in the rankings as a draft-eligible sophomore. He hit the ground running at Georgia Tech, batting near .300 and swatting 10 home runs as a freshman. His production improved this spring too, leading to less concern over the utility of his power. Johnson still has a swing built for both power and swing-and-miss, but some scouts believe there’s enough thunder in his bat to produce 25-30 home runs, even if his ability to hit for average plays as a below-average tool. Johnson has played the outfield and been a DH for the Yellow Jackets, and will have to prove himself as an outfielder at every step up the ladder. He lacks ideal foot speed and range for the position and does not have plus arm strength. 32. Taylor Trammell, of, Mount Paran Christian School, Kennesaw, Ga.
Trammell was the Georgia Class A football offensive player of the year after rushing for 2,479 yards and 36 touchdowns last fall and could have played football in college. Instead, he has decided to focus on the diamond going forward. He has committed to Georgia Tech for baseball only and is unlikely to join the Yellow Jackets because he figures to go in the first two rounds of the Draft. Because he has divided his time between two sports, Trammell still is learning how to recognize pitches, handle offspeed offerings and tap into his raw power. He does show some feel for hitting and his well above-average speed will help him reach base. With his bat speed and strength, he could develop average or better pop. Trammell also is figuring things out defensively, but he has the tools to be an asset in center field. He’s working on improving the strength of his arm, which should be fine for center. 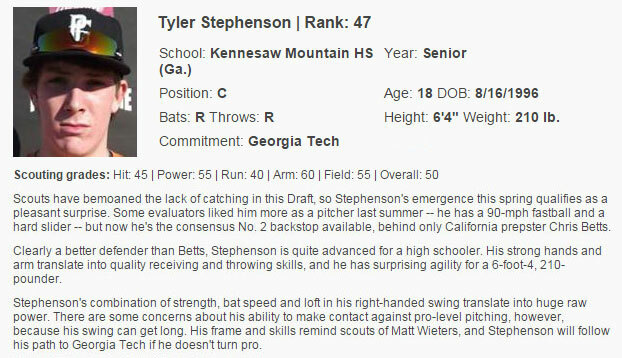 Stephenson didn’t attend many of the big summer showcases last year, instead focusing on playing summer ball in the competitive East Cobb program (East Cobb Yankees). That kept him out of the spotlight, but not off of scouts’ radars, and he also was one of the stars of the WWBA World Championships last fall. He missed a few weeks this spring due to an oblique injury, but played well in his return and subsequently shot up draft boards, even generating some buzz as a potential first overall pick. In a class that is light on catching, the Georgia Tech commit stands out. Stephenson is big for a catcher (listed at 6-foot-4, 210 pounds), but he is an excellent defender. He is very quiet behind the plate and frames pitches well thanks to his strong, soft hands. He has plus arm strength and once he gets his footwork down has the potential to be an above-average defender. Offensively, he creates raw power thanks to his strength. There is some length to his swing and he didn’t hit all that well with a wood bat last summer. But his advanced skills behind the plate will allow a team to be patient has he figures things out offensively. English came late to pitching, spending much of his early high school career as a catcher. He was again an imposing presence in Pike County’s lineup this spring and hit .632/.740/1.279 with seven home runs and didn’t strike out in 104 plate appearances, but his baseball future is on the mound. 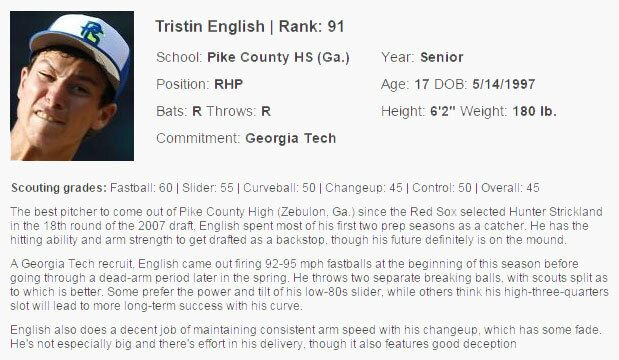 English throws his fastball in the low 90s and can get up to 95 mph with the pitch. His high three-quarters arm slot adds deception and sink to the ball. He throws a curveball and a slider, both of which have plus potential. He occasionally showed a nascent changeup last summer, but it needs more development. English was kept off the mound by a shoulder injury for a few weeks this spring, but returned to pitch before the season ended. He presents an intriguing set of raw tools for a team to develop if they’re able to sign him away from his Georgia Tech commitment. After handling a strong pitching staff and helping Buford High to a state championship this spring, Bart is now poised to become the first position player drafted in school history. He stands out most for his prowess at the plate. Bart generates easy bat speed that translates into above-average power potential. He also shows enough feel for the barrel to hit for average in addition to power. The bigger questions revolve around Bart’s defense. He called his own games in high school and has improved as a receiver. But he struggled at times this spring, especially early in the season, and many scouts think he’ll eventually move to first base. Bart is committed to Georgia Tech, as is fellow power-hitting Georgia prep catcher Tyler Stephenson, though it’s more likely Bart makes it to campus. Stallings won the home run derby last summer at the Perfect Game All-American Classic and then led King’s Ridge Christian to a state championship this spring. But scouts are emphatically divided on his professional potential, much as they were a year ago with Kel Johnson, another Atlanta-area slugger who was committed to Georgia Tech. Stallings has plus raw power, but a lot of swing-and-miss comes along with it. He’s listed at 6-foot-4, 210 pounds and likely will end up at either left field or first base, though he’s played center field this spring. Stallings’ power will play no matter where he ends up defensively, as long as he’s able to tap into it consistently. Hughes spent last summer pitching to catchers Tyler Stephenson and Joey Bart, who rank Nos. 15 and 183 on the BA 500, on the East Cobb Yankees and, like his summer teammates, is committed to Georgia Tech. Hughes is listed at 6-foot-2, 185, and can run his fastball up to 95 mph. He more typically pitches with a bit less velocity, but gets good life on the pitch when he keeps it down in the zone. He throws two breaking balls, with his slider slightly ahead of his curveball, and occasionally mixes in a changeup. Hughes earns praise for his athleticism and competitiveness. Gonzalez was drafted by the A’s in the 11th round in 2012, but chose to attend Georgia Tech instead of signing. He’s had a solid college career, but hasn’t developed quite as much as scouts would have liked. Gonzalez is an aggressive hitter with above-average speed and some raw power, but hasn’t been able to consistently get to it in games. He’s been a versatile player for the Yellow Jackets, and could end up as a utility player or a corner outfielder as a professional. Gonzalez earns praise for his makeup and work ethic. Kennesaw (Ga.) Mountain High catcher Tyler Stephenson has picked up steam this spring, and now projects as an early first-round pick. With a thick lower half and wide shoulders, Stephenson’s game is built around the power in his core. The Georgia Tech commit showed a plus throwing arm and advanced receiving skills on Friday. Stephenson is a little flat-footed behind the plate, but he remains agile, and he showed the ability to catch the ball cleanly when thrown high or deep into the lefthanded batters’ box. Offensively, Stephenson generates plus bat speed with a relatively short rotational swing. He starts with a leg kick before landing with a wide base. Stephenson drove well with his hips, but there is room for even more separation. His bat is in the zone for quite a while, with his swing plane looking like a sideways parenthesis. Stephenson finished way ahead of a pitch in his first at-bat, and hammered it hard into the ground and through the left side. 268 Kel Johnson OF/1B Home school, Palmetto, Ga. Scouting Report: Johnson was a known entity as an underclassman, breaking the East Cobb home run record as a junior. He was the runner-up to Jacob Gatewood in the Junior Select home run derby at Citi Field during the 2013 All-Star Game. A team buying Johnson out of his Georgia Tech commitment is betting on his righthanded power. The 6-foot-3, 196-pounder has a physique built for power, with a muscular build and long arms. He has an easy swing with natural leverage from an uphill bat path, but he has struggled to consistently make contact on the showcase circuit and tap into his raw power, leaving scouts to question his hitting instincts. Johnson played in a home-school league this spring and has faced little in the way of quality competition. He plays the outfield and first base, which is likely his long-term destination. He is a well below-average runner with a below-average arm and limited range. Johnson, who is mature for a high school player, is intelligent and considered to be a tough sign away from Georgia Tech. Scouting Report: After running his fastball up to 93 mph at Perfect Game National to begin last summer, Gooden looked like he had the raw material to go in the first 10 rounds. But then he went on the shelf and had Tommy John surgery this spring. In short stints, his fastball sat 90-92 mph, and more around 87-90 over extended innings, with an inconsistent curveball that flashed average potential. Some tilt in his delivery and a head snap will make strike-throwing a priority upon his return. The strong 6-foot-3, 205-pounder is expected to attend Georgia Tech.